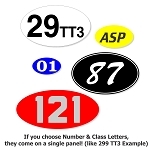 This is the basic set of autocross or track day numbers in magnetic or reusable vinyl. The set includes two 8" numbers and three 4" class letters for both sides of your car in our most popular Block Font. These are individually die cut numbers with no background! Additional single numbers are available for $7.00 per pair and additional letters for $5.00 per pair. E.G. if you select 45 as your number and need to add a 1 for a co-driver, use this option. Or if you select DSP as your class and need to add an L, use this option. 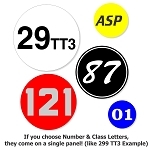 These are individual die cut numbers with no "background" and can be rearranged to create other number/class combinations. Sorry, 3d Shadow, Outline and Two Tone Effects are not available on these basic number packages. Very impressed with the ease of ordering, speed of delivery, and quality of product. I purchased a set of magnetics for a customer we're sponsoring and he is thrilled with them. My only caution would be that the class letters are slightly smaller than advertised, which means the 4" (at 3-3/4") technically do not meet the 4" minimum SCCA National standard. 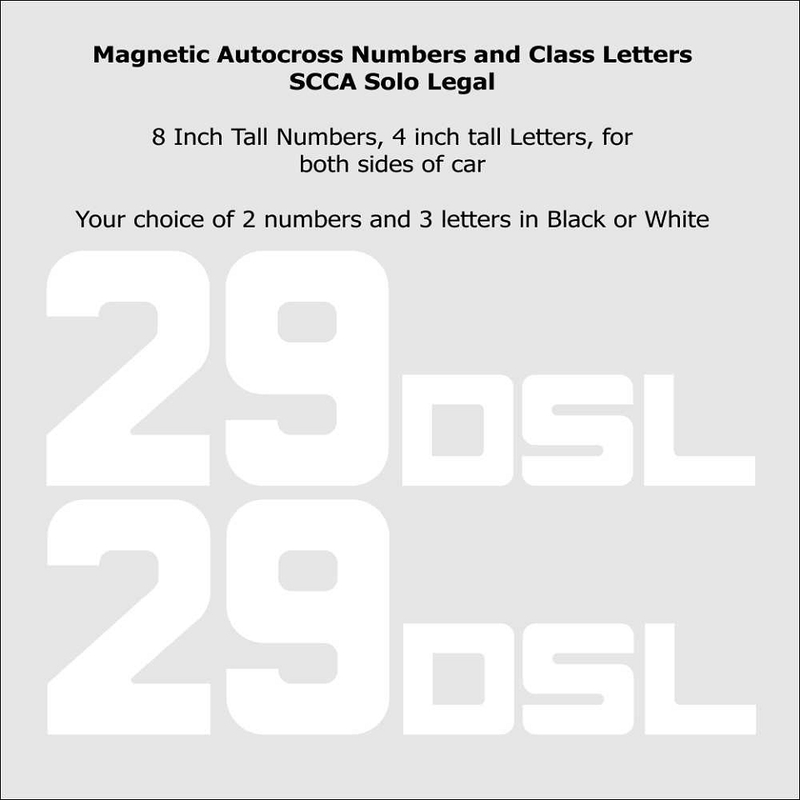 SPS does this for a specific and justifiable reason -- they can be stacked and line up perfectly with the 8" numbers -- but if you're concerned about 100% compliance at SCCA Solo Nationals, you might consider the 5" letters instead. Again... excellent quality, the folks at SPS could not have been more helpful, and the quality and convenience makes this a great product at a great price! Great set of numbers! Good, thick magnetic material, good price, super easy company to do business with. Thank you!! I'm really happy with my set. I went with magnetic and they hold well and conform to my cars curves. I recommend these to anyone who ask for inexpensive, great looking number sets. 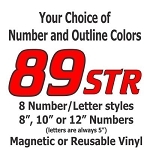 This is a good price on a decent set of reusable vinyl numbers. You do need to be careful when removing them, or the vinyl may stretch in the corners and not lie as flat next time. But they are good quality and should last for several events. It would be nice if they included a third digit. Q: These are individual numbers, correct? And by ordering an extra number and can make a three digit number on my car? Q: When you say "reusable", do you mean reusable vinyl? When ordering Number Packages, follow the steps below. Select the desired color and material (Magnetic or Reusable). There are 8 basic fonts: Block, Curved, Clear Face, Script, Neon, EuroRacer, Knockout and Racer. The Block and Curved Fonts have Slant and Left Slant variations. Effects (Outline, 3d Shadow or Two Tone) are not available for Number Packages. Enter the Numbers and Class letters needed. A Number Package includes up to 3 Numbers and 3 Letters for both the left and right side of your car. Enter the Quantity. Normally you will need 1 Number Package for one car. Solotime Reusable Number Sets. A Full Set of Numbers 0-9. Starting at $38.00 per set.